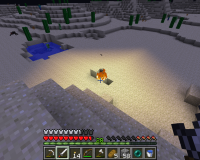 After playing a bit on my new survival world, I came across a strange thing. 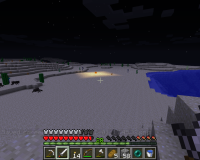 When I came up above ground in a desert biome, there were random 1x1 block fires all over the desert. The only explanation I have is lighting (I did hear a thunderstorm while I was underground), but as far as I know the fires created by lightning were supposed to burn out or be extinguished by rain. These, however, burn forever. They finally disappeared when I restarted Minecraft, but I thought I'd notify someone about this bug anyway.